This is also a short Virtual School intro to the periodic table & Mendeleev – What is the Periodic Table? ; part 1 of this Science Bank video is called ‘introducing the periodic table’ and this BBC Short Circuit Periodic Table is a 19m video. Why not try the Periodic Table time trial challenge? – it’s addictive. A dynamic (wow!) periodic table is here and lots of other periodic table designs can be found at Science Notes. Want to learn the first 10 elements? Try the Periodic Table song by Peter Weatherall. Or how about a lesson about every single element on the periodic table – created by the Periodic Videos team using the TED-Ed platform? Two short videos from The Virtual School What are groups in the periodic table? 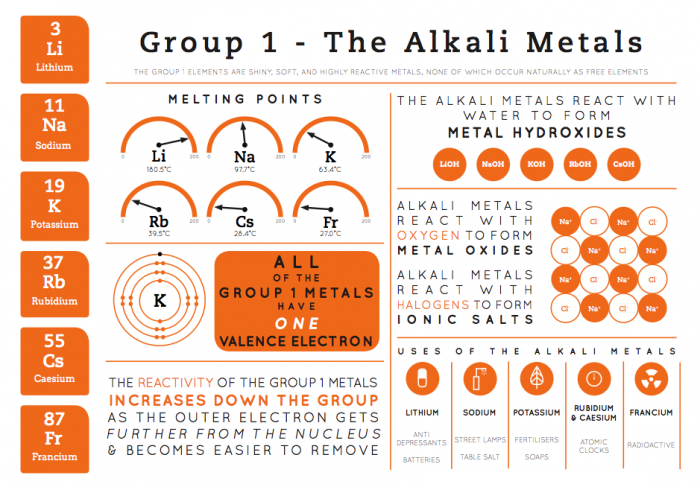 and the alkali metals. Brainiac carried out similar demonstrations – or were they faked? You decide. 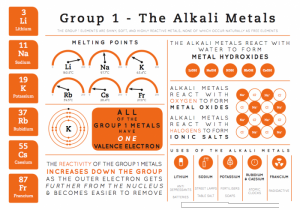 Other videos featuring the alkali metals include part 1 of Science Bank 3: Patterns of Reactivity (to 4m 10s) and Chemistry of Groups 1, 7 & 0, and a 12m lesson from ChemistryKlipz. The Periodic Table of Videos present the group 1 elements (the alkali metals): lithium, sodium, potassium, rubidium, caesium and francium (potassium has the best reaction). Infographic courtesy of the fabulous Compound Interest blog – just click on it to enlarge. 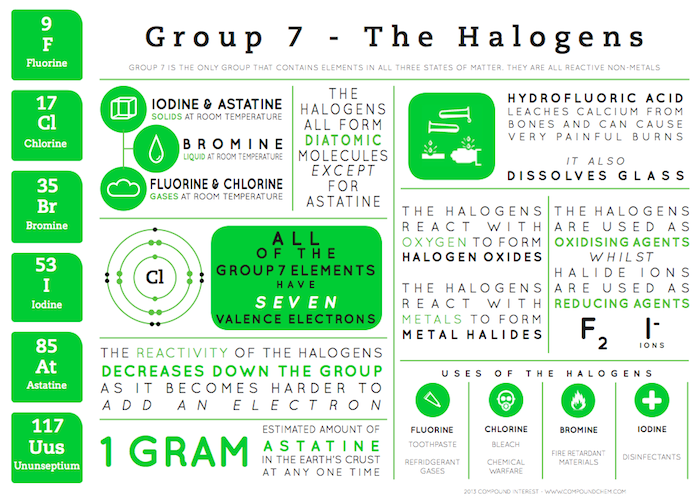 The Periodic Table of Videos present the group 7 elements (the halogens): fluorine, chlorine, bromine, iodine and astatine. 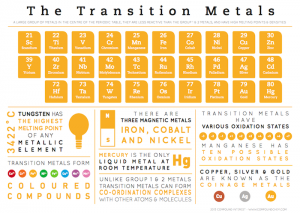 Science Bank 18 (Patterns of Behaviour): part 3 covers the Transition Metals (from 9m 25s). 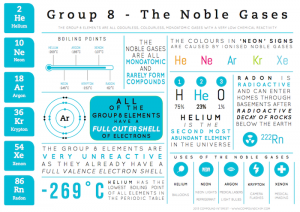 Videos featuring the noble gases also include this classic Open University clip and a 12m lesson from ChemistryKlipz: Chemistry of Groups 1, 7 & 0. Science Bank 18 (Patterns of Behaviour): part 2 covers the Noble Gases (from 4m 40s to 9m 25s). The Periodic Table of Videos present the group 0 or 8 elements (the noble gases): helium, neon, argon, krypton, xenon and radon. 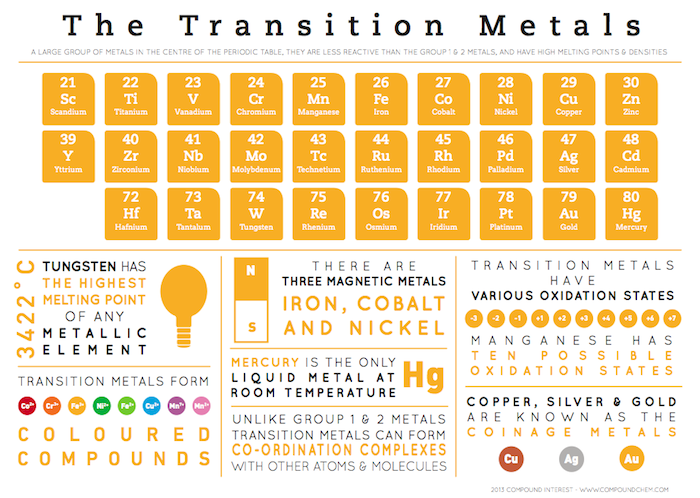 This entry was posted in C9 The Periodic Table & C10 Metals and tagged alkali, elements, groups, halogens, metals, noble gases, periodic table, periods, properties, transition on April 17, 2016 by Mr Cartlidge. This entry was posted in 9. The Periodic Table and tagged groups, periodic table, periods, properties on April 21, 2015 by Mr Cartlidge. This entry was posted in 9. The Periodic Table and tagged groups, periodic table, properties, transition on April 21, 2015 by Mr Cartlidge. This entry was posted in 9. 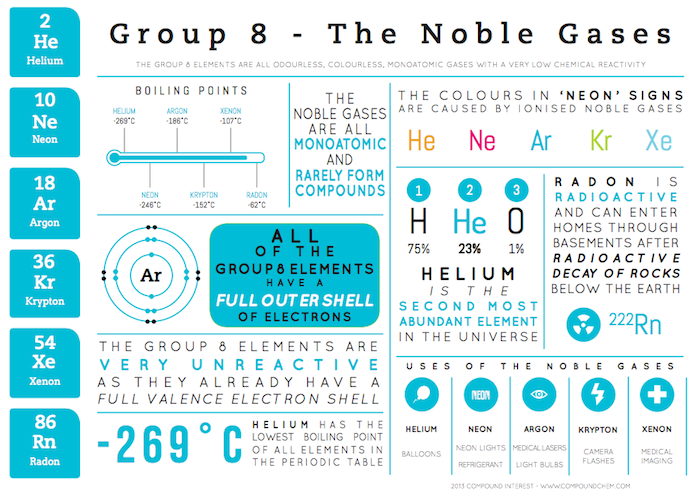 The Periodic Table and tagged groups, noble gases, periodic table, properties on April 21, 2015 by Mr Cartlidge.